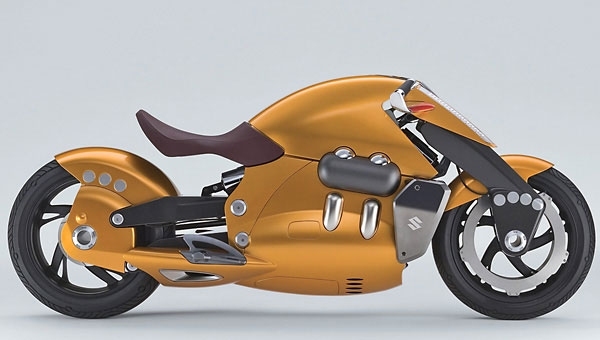 Suzuki will unveil two leading-edge concept motorcycles at the Tokyo Motor Show on Oct. 29. Biplane – No wings, but a nice open-air feeling. The Biplane is a V4-powered motorcycle with styling they say is taken from the ancient winged machines—“no canopy”—and looks something like an egg with wheels attached. Motor, tank-area, and frontal area are encased, leaving the rider out in the wind. The bike sports a perimeter-style front disc and looks more aerodynamic than a bullet (except for the rider sticking out in the wind, of course—biplane-like). Crosscage – Freedom from gas pumps, but will it wheelie? 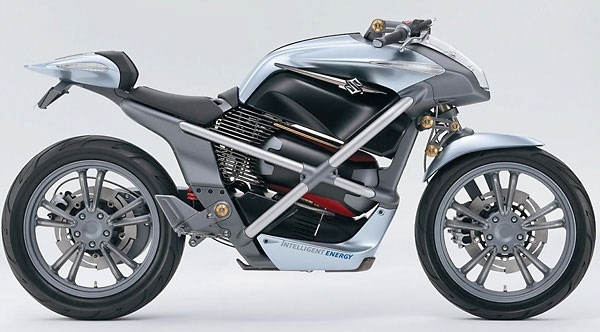 The Crosscage is a dual-powered (lithium-ion battery and air-cooled fuel-cell system) motorcycle with some styling concepts borrowed from the Biplane. It looks small and light and should sound something like a yo-yo in full swing. Don’t get your chequebook out yet, but these concepts will likely emerge in bits and pieces over the next few years.